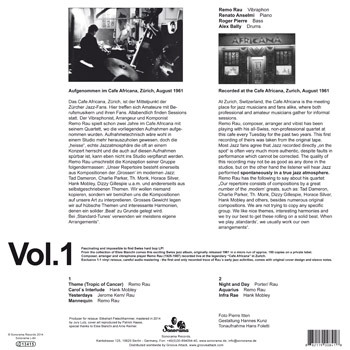 Original sleeve notes from 1961: At Zurich, Switzerland, the Cafe Africana is the meetingplace for jazz musicians and fans alike, where both professional and amateur musicians gather for informal sessions. 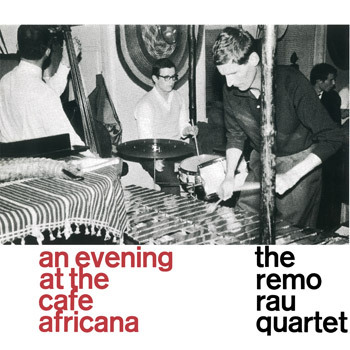 Remo Rau, composer, arranger and vibist has been playing with his all-Swiss, non-professional quartet at this cafe every Tuesday for the past two years. This first recording of theirs was taken from the original tape. Most Jazz fans agree that Jazz recorded directly „on the spot“ is often very much more authentic, despite faults in performance which cannot be corrected. The quality of this recording may not be as good as any done in the studios, but on the other hand the listener will hear Jazz performed spontaneously in a true jazz atmosphere. Remo Rau has the following to say about his quartet: „Our repertoire consists of compositions by a great number of the 'modern' greats, such as: Tad Dameron, Charlie Parker, Th. Monk, Dizzy Gillespie, Horace Silver, Hank Mobley and others, besides numerous original compositions. We are not trying to copy any specific group. We like nice themes, interesting harmonies and we try our best to get these rolling on a solid beat. When we play 'standards', we usually work our own arrangements“. Remo Rau (1925-1987) was born in Yokohama and spent his youth in Japan with lessons in piano, music theory and oboe. In 1942 he moved to Switzerland. In addition to business education he continued his musical activities. From the mid-50s, he worked as a promoter for the Zurich jazz scene, since 1959 as head of the jazz cafe-club “Cafe Africana" and in 1968 as a co-founder of the organization "Modern Jazz Zurich". As booker of the Africana in the early 1960s, he brought artists such as Abdullah Ibrahim,Horace Silver and Chris McGregor to Zurich. The jazz musician Remo Rau was influenced by the "funky" hard bop of Horace Silver along with more listening impressions. Rau told Nick Liebmann, how he was personally instructed by Horace Silver in the rhythmic and harmonic intricacies of hard bop at the Africana, with Silver sitting next to him at the piano for hours (cf. Bruno Spoerri - Jazz in Switzerland). Very early on, Rau experimented with raga or twelve-tone scales in his "fusion" compositions , also with elements of pop, funk and world music. He also realized amazing multimedia projects. Some of his concert performances like "ballet and jazz", "Ava and Edam" or "multi-media dance theater" received considerable local recognition. Rau also wrote an opera trilogy, entitled "Gaia - Crystal - Terra Nova", which was dedicated to his "dream of a peaceful world", but the piece was never performed, moreover a "Concerto for Flute, String Orchestra and Percussion" (1965-1970) broadcasted over radio, and chamber works such as a duo for violin and piano named "Caleidoscope" (1978). Remo Rau died in Zurich in 1987 because of cancer, leaving many excellent works to his posterity. As "Classical Musician" he left whole shoe boxes full of music for multimedia projects, operas, concertos and chamber music. reproduction of cover: Patrick Haase.